Author Michèle Harrison and her Royal Enfield in May, 1998. 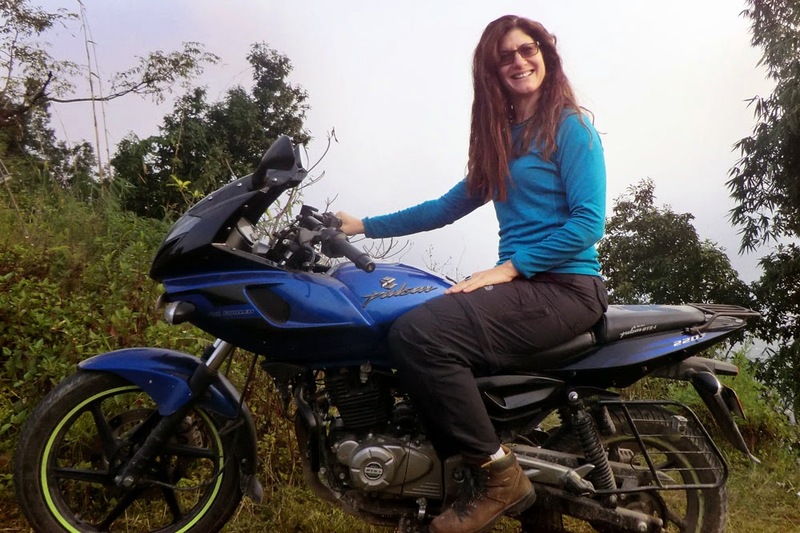 Michèle Harrison and the Royal Enfield Bullet motorcycle she dubs "Big Thumper" are the heroes of her book "All The Gear No Idea; A Woman's Solo Motorbike Journey Around the Indian Subcontinent." It's available for Kindle on Amazon (and, with Amazon's free app, for smartphone, tablet or computer as well). The book begins as Harrison, a 30-something financial services worker in London, frustrated by what seems to be a series of laughably uncommunicative men, runs off to India, with a plan — sort of. 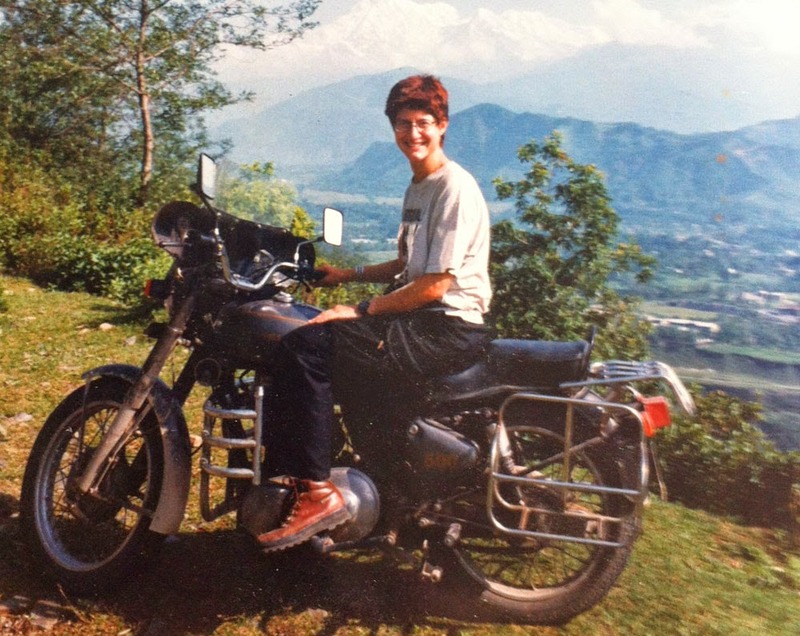 Having only just earned her motorcycle license, she buys a new Royal Enfield Bullet in New Delhi in October, 1997 and journeys on it for almost a year. She is so green at the beginning that she commits the most basic error possible on a Royal Enfield. I won't spoil the story, but perhaps you can guess what it is. "All the Gear No Idea" is a bit of a happy-go-lucky travelogue, written in a breezy, conversational tone. But this is no weekend in the country. Harrison covers 17,000 miles. There is the constant caveat that this is a woman traveling alone, perhaps up a dangerous road in bad weather with no certain idea where she will sleep this night. Harrison steadfastly refuses to acknowledge fear to people she meets — and perhaps to herself as well. Occasionally it's only the fact that there are more pages to go that reassures the reader she will survive some new danger. As she travels, Harrison finds herself often mistaken for a man, in part because she opts for a man's haircut to accommodate her helmet. But it's also because no one in the places she goes expects to see a woman traveling alone on a motorcycle. She gets propositioned a lot, and occasionally gives in to a desire for romance. Notably, these two experiences have nothing to do with one another. Her Royal Enfield Bullet is her most loyal and only constant companion and its dents and scrapes become a sort of diary of mishaps. As she travels, Harrison gains affection and respect for her Royal Enfield motorcycle. But caring for its needs leaves her with a different set of conclusions than you might be expecting. Harrison at the same spot, in October 2013. What a difference the hair makes! In the end, it's more important for her that she gains confidence in her own abilities to deal with life's challenges. "I am increasingly worried that your audience will be very offended once they find out how badly I treated my gorgeous Enfield," Harrison wrote me when I asked a question about her book. "I am sure you know by now why I called it 'All the Gear and No Idea.'" Yes. But I noticed that, in the Epilogue, Harrison's final thought is, indeed, for that battered Royal Enfield. "All The Gear No Idea" is hardly the last word on motorcycling alone across India and it probably won't be the final word on a woman doing it. Perhaps it's unfortunate that Harrison waited 17 years to publish what is, in effect, her diary. The advantage is that time gives the author perspective on her own experience. Interesting story! Can't say why but she looked pretty adventurous and smart more in the old picture than the recent.